Silence. You might wonder why you hear very little about ARX in exome studies these days. The X-chromosomal aristaless related homeobox gene was one of the first genes for epilepsies and brain malformations to be discovered. Mutations in ARX can be identified in male patients with a variety of neurodevelopmental disorders including idiopathic West Syndrome – accordingly, it’s on the differential list for patients with Infantile Spasms without a known cause. Let me tell you about the problems that the ARX gene poses for exome sequencing. ARX phenotypes. Even though I am writing about ARX in the context of Infantile Spasms, epileptic encephalopathies are usually not the first phenotype that comes to mind when hearing about ARX. The ARX gene was initially discovered in families with X-linked lissencephaly with ambiguous genitalia (XLAG). Lissencephaly is a brain malformation that is characterized by the lack of gyri of the brain. Functionally, the ARX protein is involved in neuronal migration. Eventually, ARX mutations were also found in patients with non-syndromic intellectual disability and Infantile Spasms. There appears to be some genotype-phenotype correlation in the ARX gene: Infantile Spasms appear to be associated with expansions of a poly-alanine tract in exon 2 – and this exactly seems to be the issue with exome sequencing. Misunderstanding exomes. The term exome is misleading – an exome is not an actual EXOME, i.e. the entirety of all exons in the human genome, but the product of an enrichment procedure that amplifies many but not all exons. In addition, there is no guarantee that a random exon is sufficiently covered. For most exons in the human genome, this is not an issue. For ARX, however, this is a major problem. Coverage of ARX in common exome enrichment kits. The red, green and blue bars indicate the exons of the ARX gene, which is located on the X-chromosome in “-” direction, i.e. the first exon is on the right. The first half of the second exon harbors the sites for the pathogenic poly-alanine expansions, which lead to Infantile Spasms. These regions are not covered in most exome enrichment kits (red box). The coverage plots were generated by Holger Thiele, Cologne Center for Genomics using the Varbank tool. Coverage of ARX. 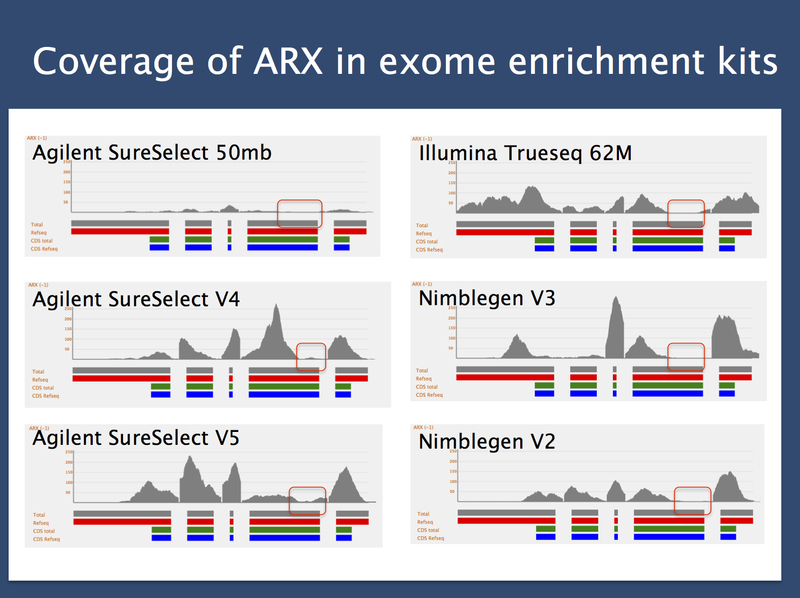 When looking at the coverage of ARX, the result is obvious for most exome enrichment kits. One of the critical parts of the ARX gene in exon 2 is basically not covered at all. These regions would not be sequenced by exome sequencing. You won’t know if your patient has an ARX poly-A expansion such as the more common c.428_451dup expansion that is know to cause Infantile Spasms. Some regions in the ARX gene associated with Infantile Spasms are well covered – however, the highly suspicious expansions in exon 2 will be missed. How to solve the ARX problem. Exomes are great to get new insight into known or novel genes, but we have to be careful when we would like to use this tool diagnostically. We cannot expect exome sequencing to guarantee that all genes are sufficiently represented. If we would like to exclude mutations in particular genes, exomes might not be sufficient. We need to apply technologies that are established and validated for each gene, such as Sanger sequencing or gene panel analysis. This entry was posted in 2014, Bioinformatics, Brain malformations, Epileptic encephalopathy and tagged Agilent SureSelect, ambiguous genitalia, aristaless related homeobox gene, ARX, coverage, diagnostic exome sequencing, enrichment kits, exome fallacy, gene panel analysis, Illumina TrueSeq, lissencephaly, Nimblegen, Partington Syndrome, poly-alanine expansion, X-linked mental retardation, XLAG. Bookmark the permalink.